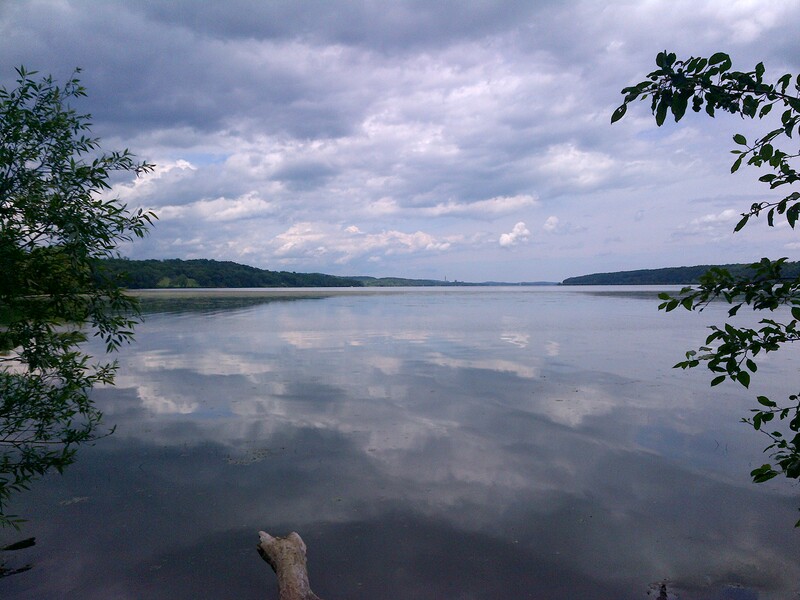 I’m keeping a promise made to myself long ago to explore the Hudson River in Upstate New York. This weekend I traveled to Saugerties, located in the Catskills. The scenery and vistas on a dramatically overcast day are stunning. I see how this river has inspired painters and other artists for, well, just over 400 years now. I’ve gotten interested in the Hudson River painters and the river’s art movement. It’s associated, from what I can tell, entirely with the river in New York state. 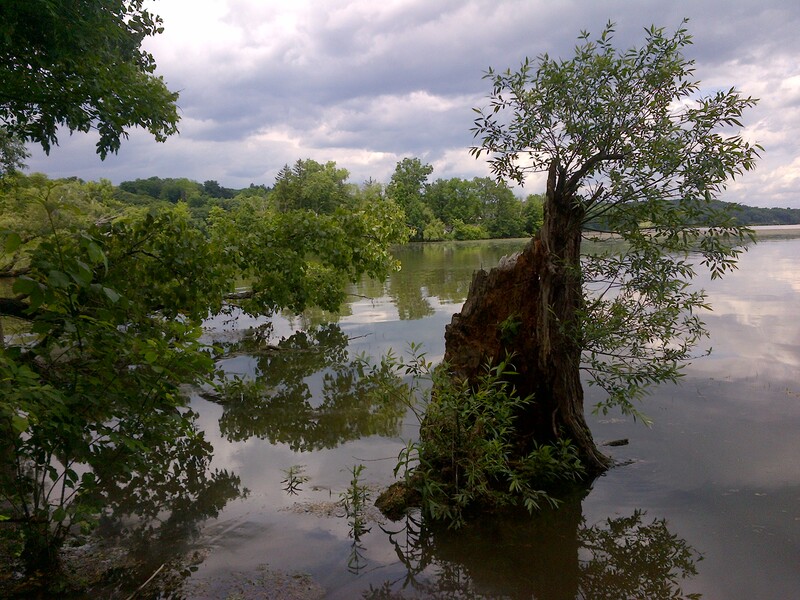 Does anyone know if any artists on the New Jersey end of the river in Hudson County were known for painting the river? I haven’t found any information about that. If there ever was a trend of painting in the urbanized section of the Hudson, I would like to explore that in a television piece. I’ll be checking out other sections of this magnificent American waterway over the summer. I see that Yahoo News just featured blind painter Bojana Coklyat in a story. And as a result a lot of web searches are leading people to my blog at website to find out more about her. I’ve interview Bojana twice, most recently last year for ON THE SCENE. In fact our interview was nominated for a New York Emmy Award a couple months back. Bojana lost her much of her eyesight due to diabetes when she was in her late 20s. She’s legally blind. Yet she doggedly learned to paint again. To see her story please go to the Credits page of this website. Do something for yourself today. Watch Bojana’s story and feel inspired about life. In just a few hours we’ll be headed to the Marriott Marquis in Times Square for the Emmy Awards. It’s a big, black tie gala with close to a thousand people filling the ballroom. TV professionals, people who talk for a living, so the room can get LOUD. Wish us luck. As I’ve mentioned ON THE SCENE is nominated in the Arts category for a beautiful piece we did called “Through Bojana’s Eyes” a profile of painter Bojana Coklyat who suffered vision loss and a life and death battle with diabetes. The Emmys Are Almost Here! The New York Emmy Awards ceremony will be Sunday, April 1st. Wish us luck, “ON THE SCENE” is Emmy nominated for “Through Bojana’s Eyes,” an emotional profile of painter Bojana Coklyat who has battled back from vision loss and chronic diabetes. 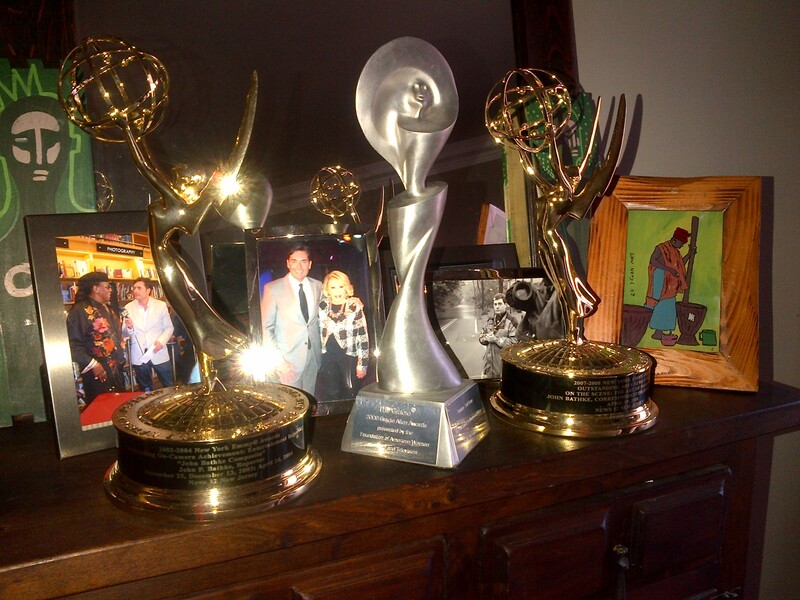 It’s my honor to have received two previous Emmys for coverage of arts and entertainment (2005, 2009) but it always surprises me when people ask, “where do you keep them?” So, the FIRST TIME from the living room to the blog, here’s a picture of the Emmys. (Btw, that’s a Gracie Award that they’re bookending. And recognize who’s in the pictures with me?) No, I don’t keep the awards on some gilded shelf or behind glass. That’s not how I roll, which you know by now! This is late notice to you, apologies, been an extremely busy week. But the ON THE SCENE episode with the cast of “Red” at George Street Playhouse (Bob Ari, Randy Harrison) and my interview with artist Peter Max, will be on again this weekend. Tune in to News 12 New Jersey at 8:30 AM, 11:30 AM or 4:30 PM on February 24th or 25th. This show got a big response so we decided to air it get soon, and also before “Red” closed to move on to its run in Cleveland. You are currently browsing the archives for the Painters category.